Senate Bill 3441, sponsored by state Sen. Pat McGuire, D-Crest Hill, and state Rep. Robert Pritchard, R-Sycamore, authorizes the Illinois Board of Higher Education to make agreements with other states to guarantee distance learning programs maintain common standards and that completed course work is recognized by institutions in each state. The agreements will also establish a mechanism for handling complaints and refunds across states and institutions. The new law is effective Jan. 1, 2015. Read more in the Morton Times News. Rep. Tom Demmer, sponsor of "Rita's Law"
When out-of-staters are asked what comes to mind when they think about Illinois, government corruption is right up there near the top of the list. 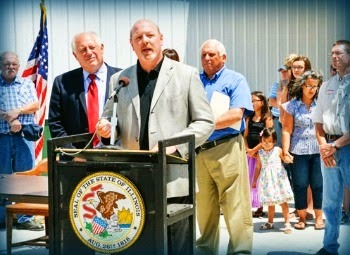 Today marks the 407th day since the Hydraulic Fracturing Regulatory Act was signed into law by Governor Pat Quinn. However, hydraulic fracturing still has not begun in Illinois because the necessary rules have not been implemented by the Quinn administration. Despite the urgency felt by most, the Illinois Department of Natural Resources (IDNR) has failed to issue final rules and has reportedly hired only a few of the dozens of employees they need to complete their rulemaking assignment, thus causing this enormous resource to sit untapped. 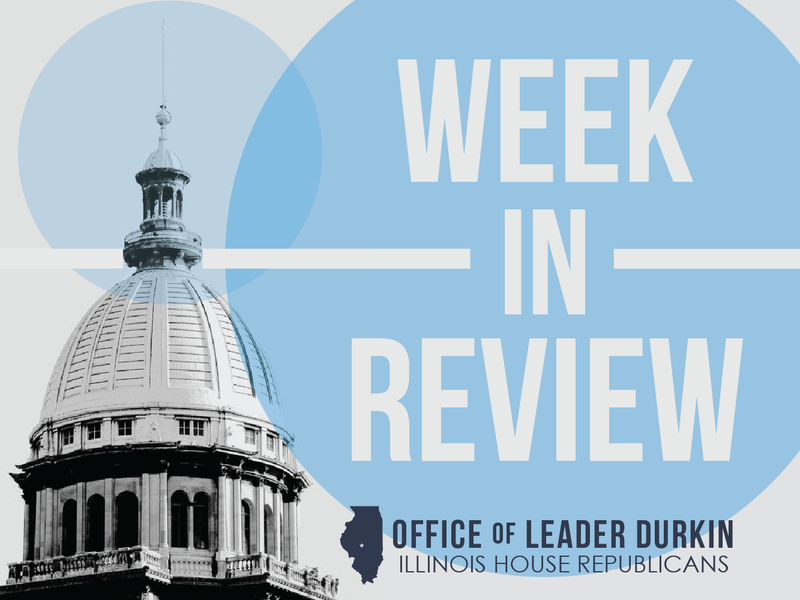 "The Quinn administration has failed to implement the law that passed overwhelmingly by a bipartisan group of lawmakers,” said Mark Denzler, vice president and COO of the Illinois Manufacturers’ Association. “Illinois’ hydraulic fracturing law has the strongest set of regulations in the nation, backed by environmental organizations, business community and agricultural interests. 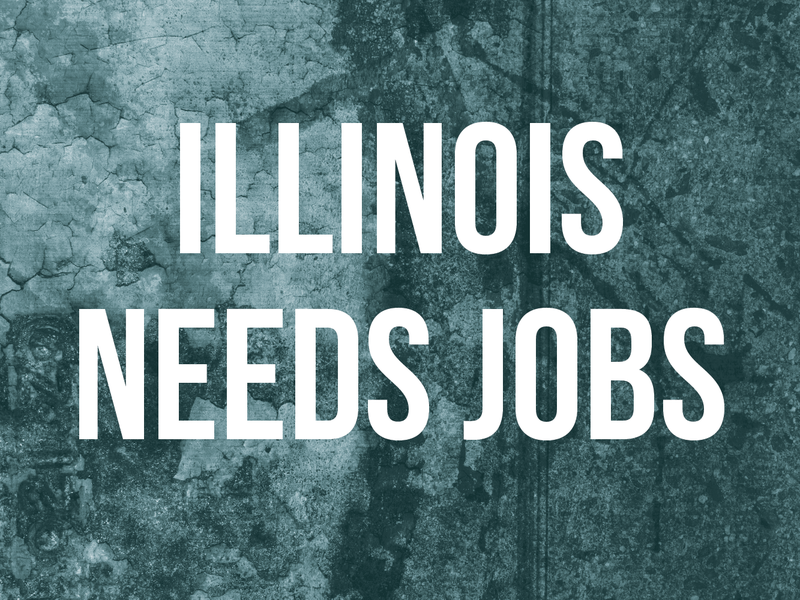 Additionally, Illinois has one of the highest unemployment rates in the country, yet Governor Quinn is allowing politics to derail the creation of thousands of jobs and millions in tax revenue." It's been five years since the Great Recession ended, but you'd never guess it by looking at Illinois' bleak economic statistics. The state's unemployment rate sits at 7.1 percent. More telling is the fact that Illinois suffered its largest monthly workforce loss in recorded history in June. And a recent report shows that while the nation as a whole has recovered the nine million jobs lost in the worst economic downturn since the 1930s, Illinois has yet to come close to recouping its job losses. Illinois has 184,000 fewer jobs than it did before the 2007 financial crisis, and the state's collective non-farm payroll is 3.1 percent below what it was in December 2007. Capital bills become law: $1.1 billion to be spent on transportation projects. The 2014 capital plan centers on $1.0 billion for shovel-ready Illinois Department of Transportation projects, primarily road resurfacing and bridge renewal and repair. $100 million is included for grants to local governments for local capital projects; it is expected that these will also mostly be transportation projects, although the definition of road and street work on the local level also includes other infrastructure repairs such as the rebuilding of local sidewalks and curbs. The Illinois Department of Natural Resources has announced cancellations in the Late Winter Deer Season for the 2014/2015 season that will affect hunters in Menard & Sangamon counties. According to the IDNR, Illinois strategy is shifting from deer herd reduction to maintaining or increasing deer populations. As a result, NO permits will be issued for Late Winter Deer Season 2014/2015 for hunting in Menard and Sangamon Counties. Read more on Rep. Rich Brauer's website. 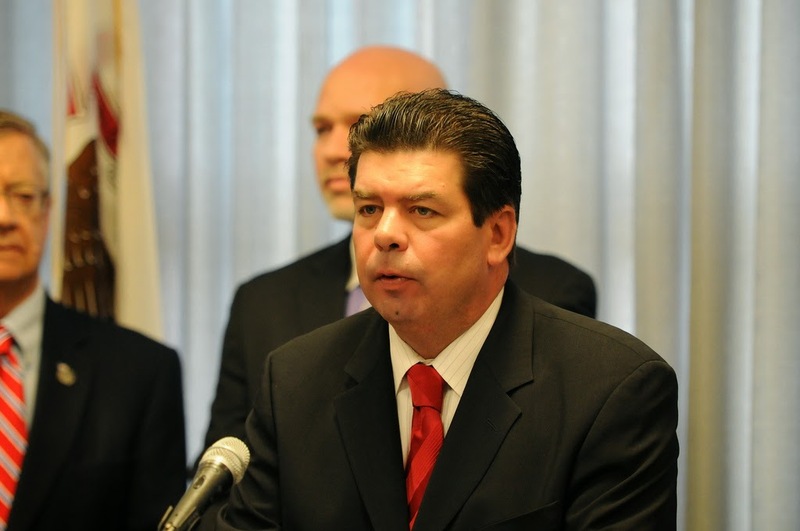 For the second time in a week, a coalition of business and labor organizations called on Gov. Pat Quinn's administration to move faster in getting hydraulic fracturing rules in place. 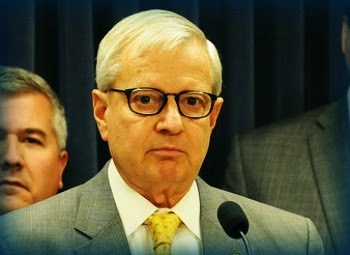 The group, called "Growing Resources and Opportunity for the Workforce in Illinois," gathered in the Capitol to say the state is losing out on jobs and investment that go along with the controversial oil and gas extraction process. Read the story by Kurt Erickson in the Herald & Review. Newly released emails from Gov. Pat Quinn’s office show politics appeared to trump credentials when deciding how big a serving some nonprofits should get from his now-tarnished $54.5 million Neighborhood Recovery Initiative anti-violence grant program. Emails from Quinn’s former top aides recount how Cook County Recorder of Deeds Karen Yarbrough, a Maywood Democrat who had been the suburb’s state representative, approached Quinn’s administration in January 2011 to oppose giving NRI funding to a longtime social service provider in Maywood. Dave McKinney and Frank Main have the story in the Chicago SunTimes. The Illinois Department of State Police is recruiting Forensic Science Trainees and has posted 20 positions for training in Sangamon and Cook Counties on the Work4Illinois webpage. The Forensic Scientist Trainee position requires an undergraduate degree in forensic science or one of the natural sciences. Commonly recognized natural sciences include college/university majors in disciplines such as agricultural science, animal science, biochemistry, biology, botany, chemistry, geology, medical technology, physics, preliminary medicine, and zoology. Trainees are paid while learning their new profession. You'll find more information about the trainee positions and program on the ISP employment webpage. 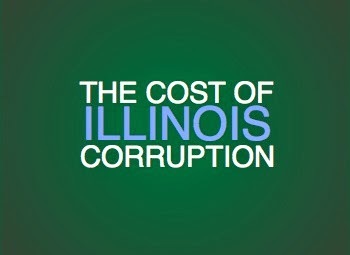 Taxpayers in Illinois pay an additional $1,038 per person in taxes because of the state's corruption, according to a recent study by two university professors. The cost of corruption, however, is much higher than that. John Mikesell, from Indiana University and Cheol Liu, from the City University of Hong Kong, determined that that 10 most corrupt U.S. States – which includes Illinois – would have spent 5.2 percent less between 1997 and 2008 if they had only an average amount of corruption. The analysis also found that the most corrupt states spend less on elementary, high school and college eduction, health care and hospitals than their less corrupt counterparts. Read the Herald-Review opinion piece in its entirety. Commission to reconvene October 8th; more than 100,000 missing emails could contain key evidence in growing scandal. The General Assembly’s Legislative Audit Commission has opened a new round of hearings to further reassert oversight responsibility over the activities of the former Illinois Violence Prevention Authority (IVPA) and its troubled, Chicago-based Neighborhood Recovery Initiative (NRI) program. This $54.5 million, taxpayer-funded initiative sought to use social-work grants to reduce violent crime rates in troubled neighborhoods located within Chicago and nearby suburbs. A February 2014 State audit, performed by the Auditor General at the urging of Rep. David Reis and other Republican lawmakers, disclosed comprehensive failures in the fiscal controls and executive governance of the program. Meanwhile, violent crime continued to affect targeted Chicago neighborhoods. You could call it Rita’s Law. A bill requiring Illinois cities and counties to get annual audit presentations was signed into law Thursday. 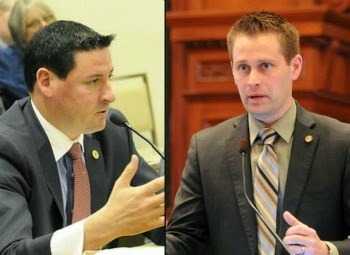 The bill was sponsored by state Rep. Tom Demmer, R-Dixon. House Bill 5503 unanimously passed both chambers of the state Legislature on May 22. 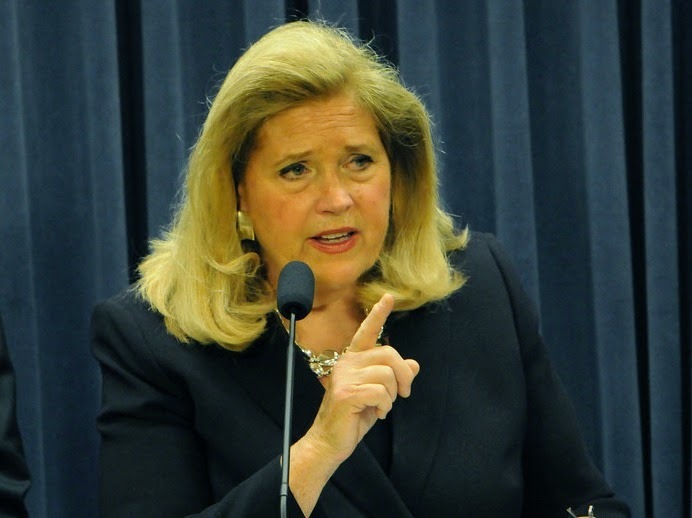 The bill, Demmer has said, was inspired by former Dixon Comptroller Rita Crundwell’s theft of nearly $54 million over 2 decades. Read more of the story by Kathleen A. Schultz at SaukValley.com. Illinois has become the first state in the nation to enact a comprehensive set of standards to ensure transparency in the management and oversight of state grant funds. The Grant Accountability and Transparency Act, signed into law by the Governor on Wednesday, strengthens and streamlines requirements for all state grants across all state agencies. The reforms include stronger state grant procedures to bring them in line with federal standards; improved conflict of interest disclosure requirements; and strict, real-time auditing of all state grants. 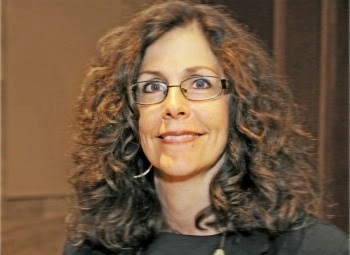 The new law is in response to a report by the Illinois Single Audit Commission, created last year by legislation spearheaded by Leader Patti Bellock, which found that, currently, the Illinois grant process has no common application, no common grant agreement, a lack of transparency, no uniform administrative rules, and a lack of a State-wide non-compliance list. Many of these issues are what result in the ability to misuse grant funds. The legislation co-sponsored by Leader Bellock and signed by the Governor remedies all those current failures. Read more. 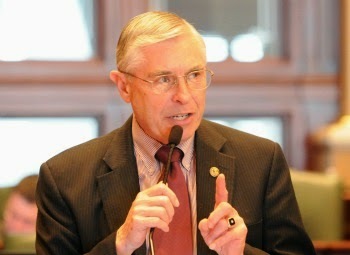 State Representative Don Moffitt was recently appointed as a member of Governor Quinn’s Council on Health and Physical Fitness. The Council is charged with encouraging Illinois citizens to participate more actively in health and fitness activities. Members appointed to this committee serve without pay. Read more. 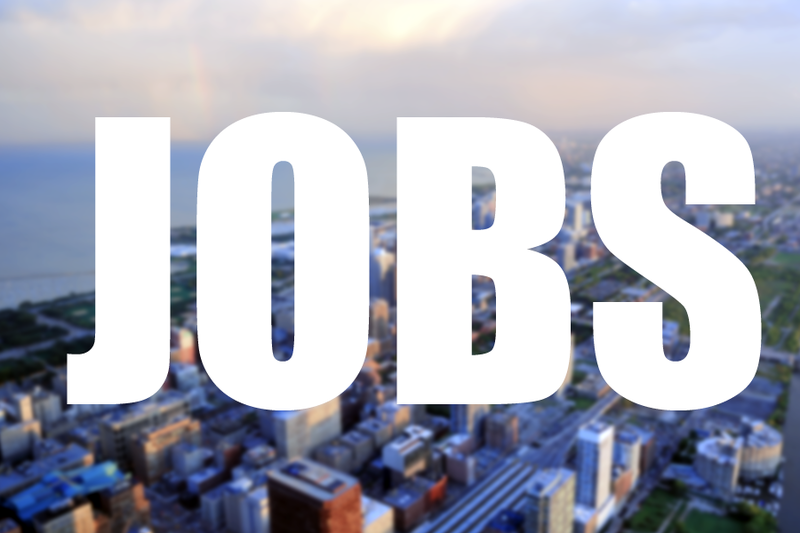 The Illinois Department of Employment has a new site to help you find a job. "Unlike most online job posting sites, creating an IllinoisJobLink.com account is free. Plus, it's fast and easy." Reports surface that federal investigators are requesting that the Legislative Audit Commission suspend its inquiry for 90 days. The U.S. Department of Justice’s request could delay efforts by the Commission to hear testimony from key former aides to Gov. Pat Quinn, including former chief of staff Jack Lavin and ex-deputy chief of staff Toni Irving. The Commission has subpoenaed seven witnesses to testify on the scandal-plagued Neighborhood Recovery Initiative (NRI) at a two-day hearing scheduled to start on Wednesday, July 16. 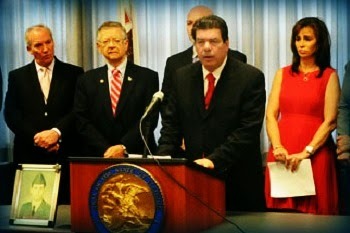 Two area lawmakers have been selected for a new panel addressing illegal gun trafficking in Illinois. 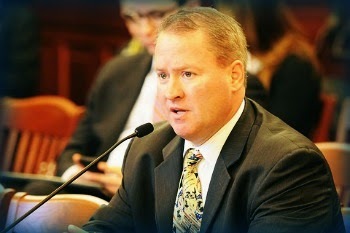 State Reps. John Cabello, R-Machesney Park, and Joe Sosnowski, R-Rockford, were appointed by House Republican Leader Jim Durkin, R-Western Springs, to serve on the new bipartisan task force charged with developing a comprehensive plan, including legislative proposals, to disrupt the flow of illegal guns into the state. “Most gun violence throughout Illinois and the City of Chicago isn’t caused by law-abiding gun owners, rather it comes from criminals who possessed firearms illegally,” said Cabello. “As a strong supporter of the Second Amendment, I look forward to serving on this committee to put more tools in the hands of law enforcement to keep guns out of the hands of criminals while continuing to protect the rights of upstanding gun owners.” Read the entire story in the Rock River Times. 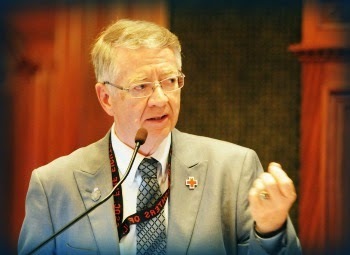 Illinois Lawmakers Study Heroin "Epidemic"
Now, two Illinois legislative committees are studying the growing use of heroin in Illinois and one of the more alarming findings of their studies is a trend twoard younger and younger users. Read the entire story on CSNChicago. 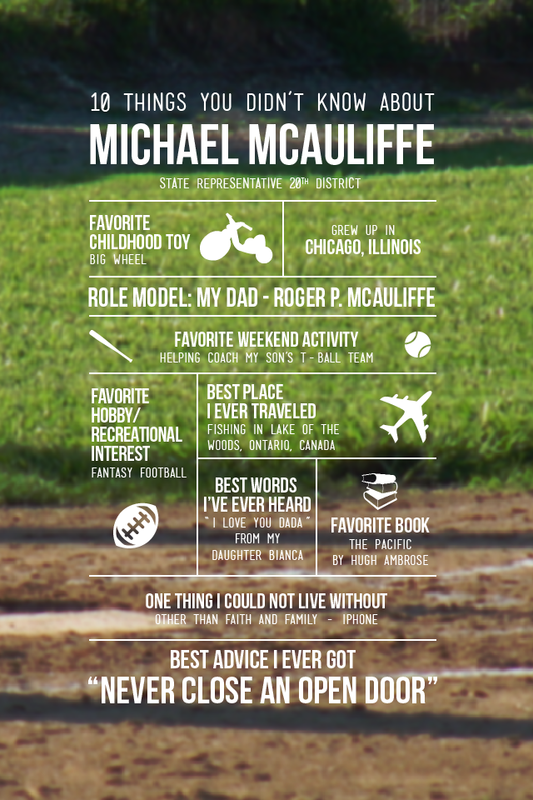 Rep. Michael McAuliffe is a lifelong resident of the 20th legislative district. 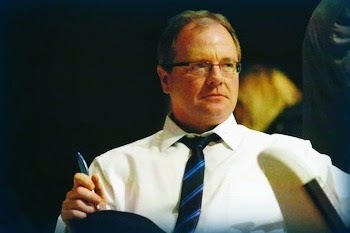 As a full-time legislator, he is the spokesperson on both the Healthcare Licenses and Veterans Affairs Committees. Additionally, he is a member of Appropriations on Public Safety, Healthcare Availability Access, Museums & Cultural Enhancement, Public Utilities, and the Tourism & Conventions House Committees. More about Rep. McAuliffe. Rebuilding businesses hit by the November tornado just got a little easier. It's thanks to a new law. It says small business owners can catch a break on property taxes if they rebuild after a disaster. It is protection similar to what homeowners already have. A few years ago, when a tornado hit Harrisburg, a law was signed. It makes sure homeowners rebuilding after a disaster aren't hit with higher property taxes right away. After disaster hit Gifford, a small business owner realized he needed that protection for himself. Read the rest of the story on Central Illinois Proud. A metro-east lawmaker says investigators might not have received all of the emails they sought in connection with Gov. 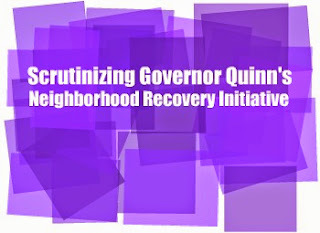 Pat Quinn's scandal-tainted Neighborhood Recovery Initiative, an anti-violence program that critics say was used as a political slush fund. The grant program is the subject of a federal investigation and also came under fire from the state's auditor general. The auditor general, in a blistering report issued in February, found there were "pervasive deficiencies" in how the program was operated. But some emails from Quinn subordinates involved with the program might have been hidden from the auditor, according to Rep. Dwight Kay, R-Glen Carbon. The News-Democrat has the story by Brian Brueggemann. Last week Sheri Jesiel was appointed to fill the vacancy left by retiring State Rep. JoAnn Osmond, following her twelve years of distinguished service to the 61st District. 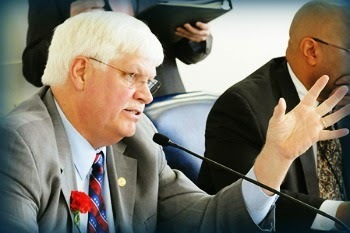 Subsequently, House Republican Leader Jim Durkin has appointed Rep. Jesiel to a number of committees previously held by Osmond. Those committees include Appropriations Public Safety, Insurance, Human Services, Public Safety – Police and Fire, Tourism and Veterans Affairs. 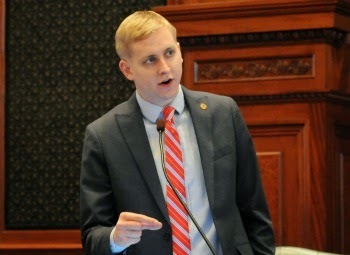 House Republican Leader Jim Durkin on Monday selected Ed Sullivan Jr. (R-Mundelein) to the Illinois House Republican Leadership Team. Sullivan will take the spot left vacant by JoAnn Osmond who recently retired. The leadership team is responsible for developing an agenda for the caucus; working through controversial issues and guiding other members. “When pressure is high and tough lifting is required, I can count on Ed to be there,” said Durkin. FY14 ends; Quinn signs FY15 budget bills. The partisan FY15 budget, enacted by the Democrat majority over strong Republican opposition, was signed on Monday, June 30, the final day of the expiring fiscal year. The governor imposed one veto of a non-GRF spending line but left the $35.7 billion general funds spending plan untouched. This veto could be addressed during the fall Veto Session to be held in November 2014. 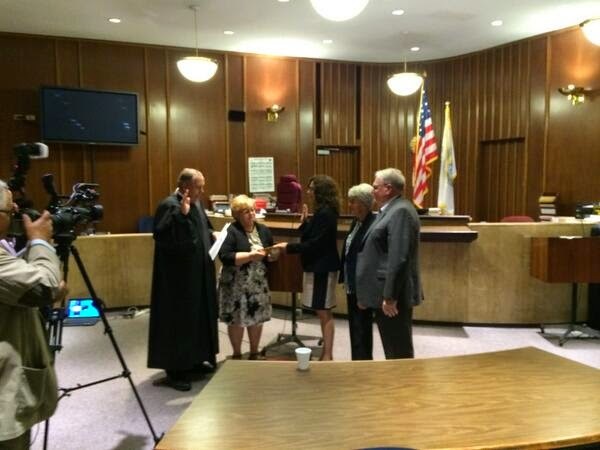 Zion-Winthrop Harbor, Illinois - On Wednesday, July 2nd, newly appointed State Representative Sheri Jesiel was sworn into office by Judge John Phillips. Jesiel will replace retiring State Representative JoAnn Osmond in the 61st district, who was appointed in December 2002 following the death of her late husband. 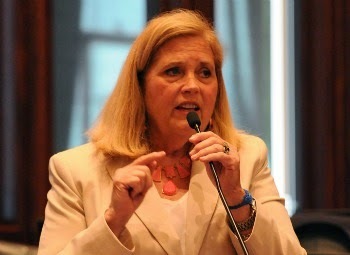 On March 18th, Sheri won the Republican primary to serve in the Illinois House, having been unopposed. “I am proud to serve the taxpayers, families, seniors and young adults of our communities. I intend to continue the long tradition of fiscal responsibility as exemplified by JoAnn Osmond and her late husband, Tim,” Jesiel said. Sheri Jesiel is a mom, “Nana”, homeowner and taxpayer who believes that common sense and sound management practices must be brought to Springfield. Sheri is a lifelong resident of the Zion-Winthrop Harbor area and is a graduate of Carthage College where she graduated with a Bachelor’s in Business Administration and Accounting. She is currently employed as an accountant/business manager with Christ Community Church in Zion. Lincoln's Generals were instrumental in helping him win the Civil War. Eight of those leaders were Illinoisans. A person can fly roundtrip from Chicago to Springfield next week for a little over $200. So, why are Illinois taxpayers spending nearly five times that amount to fly politicians and bureaucrats the same route? One of the state's four daily shuttle flights arrives at Springfield’s Abraham Lincoln Airport. The King Air 350 Turboprop seats nine passengers, but on one morning last fall, FOX 32 saw only one passenger get off the plane. That flight from Chicago cost taxpayers more than $2400. Read more by FOX 32 News Investigative Reporter Dane Placko.